Before the review, I want to thank Uncle Wilson @ Jaben for the samples. Compared to other models of the same line, Shroom's packaging is definitely more shiny and psychedelic. 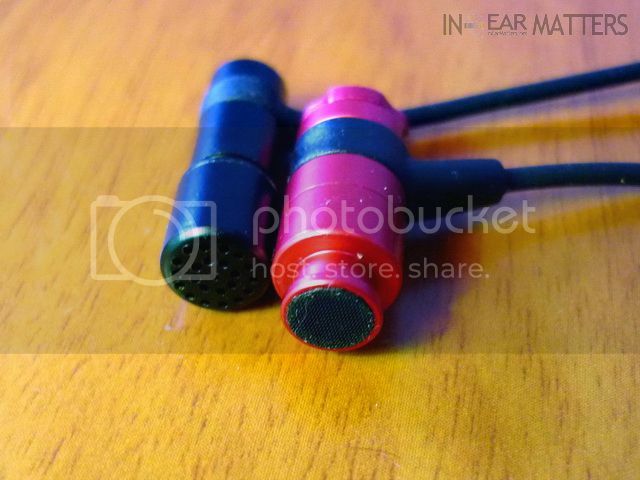 Inside, you will find the IEM itself, a synthetic leather soft pouch (like that of NuForce NE-7M), three pair of different sized black eartips (small, mid, large) and three pair of different sized red/blue colored eartips - very shroomy indeed. 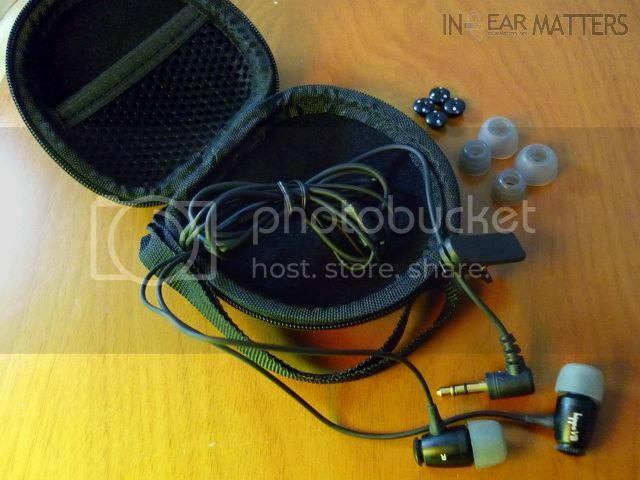 One of the first things you would probably notice is how small the actual earpieces are. The general shape resembles that of CrossRoads' Quattro, but smaller in diameter. In fact, the dynamic transducer used in Shroom is 1mm smaller in diameter compared to that of Quattro's. Also, the transducer is designed to be in the front of the nozzle (which is larger in diameter than the earpiece housing) for a more 'intimate' sound, but we will leave that discussion for later. Isolation wise, I find it to be above average and good enough for fairly noisy environment. Microphonics is just about average. You will want to find a shirt clip to go with it. The mini plug is of an interesting design, kind of like old UE design but more rounded and smaller. I like the design but I wish the strain relief can be longer and more flexible. One of the main features on Shroom is its transducer placement, which almost at the tip of the nozzle. 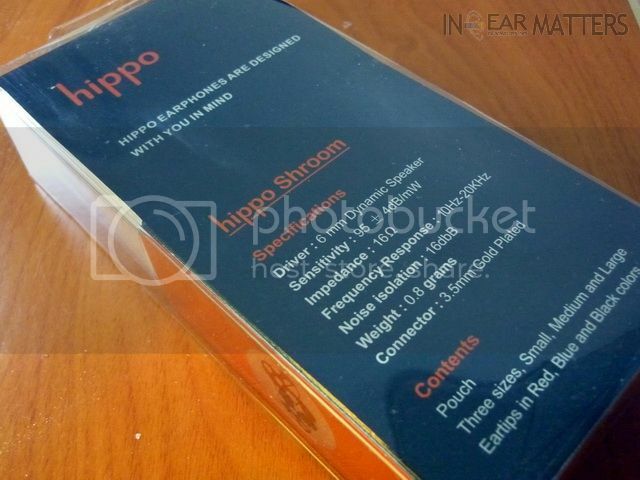 As a result, the eartips used are specially made for Shroom to accommodate the extra wide nozzle, which means the possibility of aftermarket eartips replacement is out-of-question. 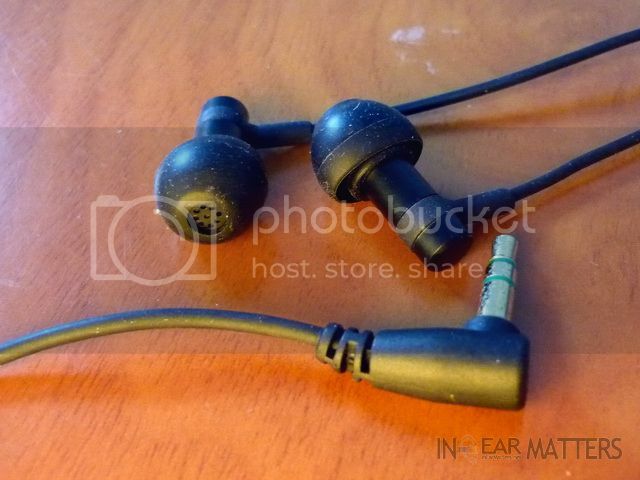 The good news is, the eartips themselves is pretty good in quality. But due to the nozzle diameter, I would suspect people with very small ear canal size will probably have a hard time getting a comfortable fit. 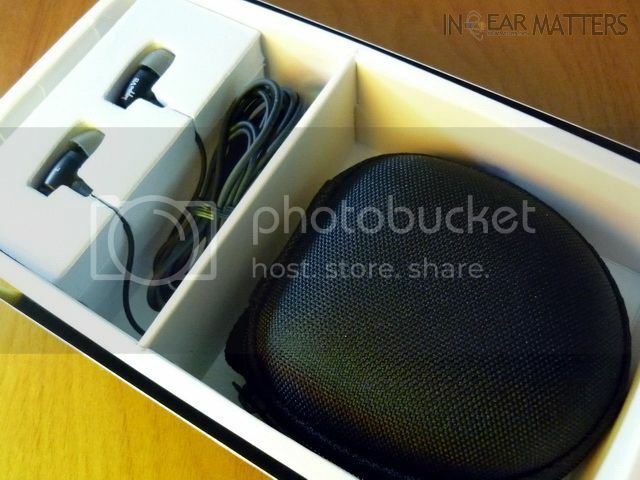 The design also introduces a new problem, earwax and dust accumulation. While it is not uncommon to see earwax buildup on the nozzle on any IEM, the more exposed Shroom transducer (sitting just behind the mesh / vent) is more vulnerable to such a problem. You will require cleaning it out the mesh / vent regular with a needle to make sure there won't be any obstruction - not a particularly hard thing to do but it must be done. 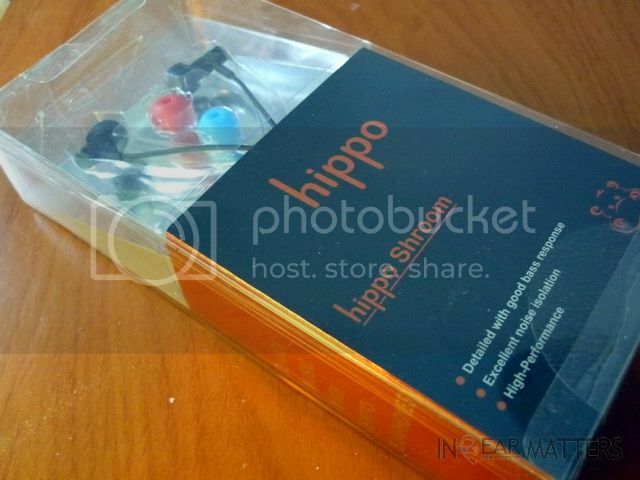 Overall, the build quality is similar to the latest CrossRoads MylarOne or he previously reviewed Hippo Boom. Decent, not the best there is but neither is it bad. It is not designed for rough use so some caring will be needed in order for it to last a long time. Shroom and Quattro, both without eartips. Shroom has the transducer on the tips / nozzle while Quattro's is inside the housing. 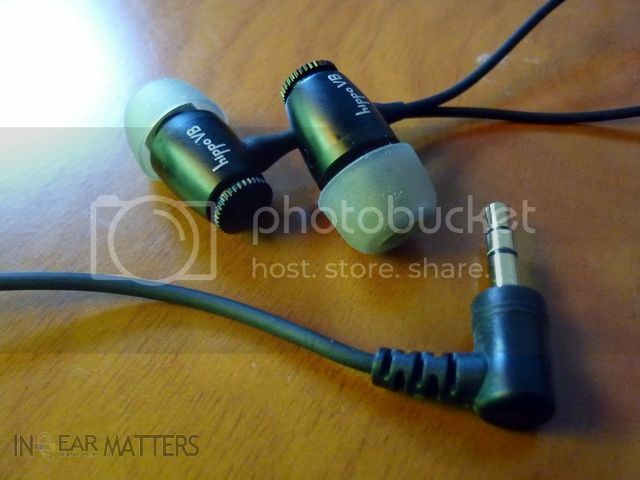 As usual, I gave the Shroom a standard 50hrs minimum burn-in before the review (like I did with all IEM I reviewed). Since there is not possible to use any other eartips and there seems to be no sonic difference b/w the black and colored eartips, I ended up using the stock black midsized eartips for the review. I first saw the concept of placing the transducer as close as possible to the eardrum on one of JVC low end 'bi-metal' series. The elimination of most of the front housing and nozzle were claimed to help reducing any unwanted reverberation. In that sense, it is probably fairly effective on Shroom. Its sound, in short, is very clean and transparent. The overall sound signature of Shroom is between neutral and balanced, but still remains largely neutral and analytical. Treble is well extended with good sparkle and resolution, but it will occasionally sound a little bit sibilant on brightest note. The mid is well presented too. Vocal is clean and a bit upfront, but not full nor sweet and can sound a little lean at time. Bass has good speed and decent impact, but not excessive in quantity. It also rolls off more significantly on the lowest part of the sub-bass region. So basshead needs not apply. Soundstage is above average, airy and transparent with good decay. Clean, transparent, and analytical sound is where Shroom's strengths lie, but in a sense it can be too lean for those who prefer a warmer, sweeter vocal or big bass. Shroom is more in line with ADDIEM's sound signature, but slightly better on overall performance. I consider the overall SQ to be about the same as iM-590 - just that iM-590 has better bass and mid while Shroom is better at treble and transparentness. 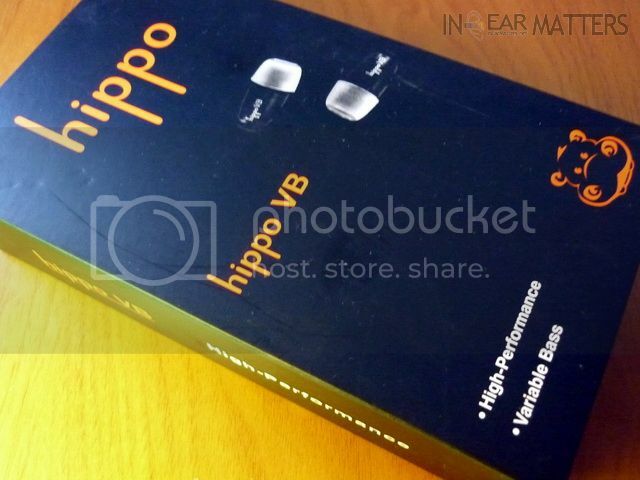 VB's packaging is similar to that of Hippo Boom, just black paper box. Inside, you will find the IEM itself, a hardcase, a shirt clip, three pair of different sized eartips and of course, the three pair of bass tuning plates. Despite the printing on the paper box, the bass tuning plates are marked wrongly / in reverse. Instead of no dot representing the weakest of bass, it is actually the strongest, and so on. 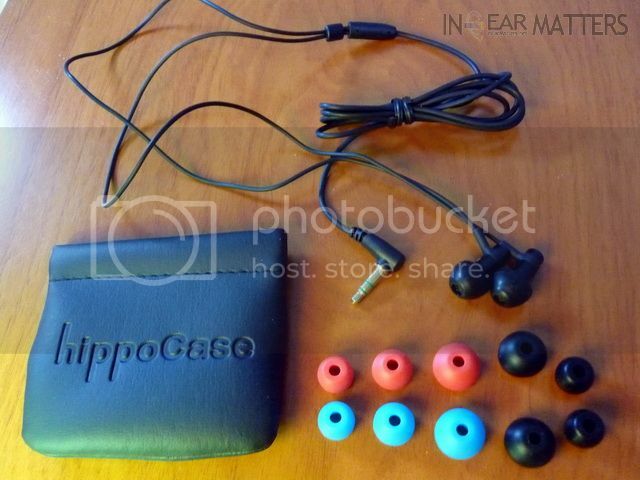 The hardcase is pretty decent in quality, which is expectable since Hippo started as a headphone case brand. The earpieces resemble that of the Denon C700 series, but with rear exchangeable bass plate. The nozzle is filter-less. The main housing is made out of anodized aluminum which has a solid feel and weight to it. The bass tuning plates concept is similar to that of Quattro's, but improved in the sense that VB's bass plate has rubber o-ring to hold the plate in place so it won't get unscrewed accidentally. The only complaint I have is about the stock eartips, which have a rather springier inner core that isn't as soft as it should have been. It is just not as comfortable as normal single flange. I end up swapping them with the regular Audio-Technica style single flange which is much comfier in my ear. Isolation wise (on the swapped eartips), the two dotted mid bass plate is about average. The dot-less big bass plate is slightly below average since it turns the IEM into a full opened-back design, while the triple dots small bass plate give above average isolation. Microphonics issue is decent. Overall, I find the build quality to be slightly better than Shroom due to the more robust design, but it is still not the kind of headphone that you can / should abuse. Like Shroom, I gave VB a standard 50hrs minimum burn-in before the review (like I did with all IEM I reviewed). The eartips of choice, as mentioned above, is a pair of generic Audio-Technica style single flange due to comfort issue. The overall sound signature of VB is lively and on the warm side. On the triple dotted / small bass plate, bass has a decent impact but less in quantity and more toward neutrality. Mid and treble are drier and brighter. Soundstage is also noticeably narrower. On the two dotted / mid bass plate, bass has a very good body and depth, especially on the mid-bass region (and it does go down deep). 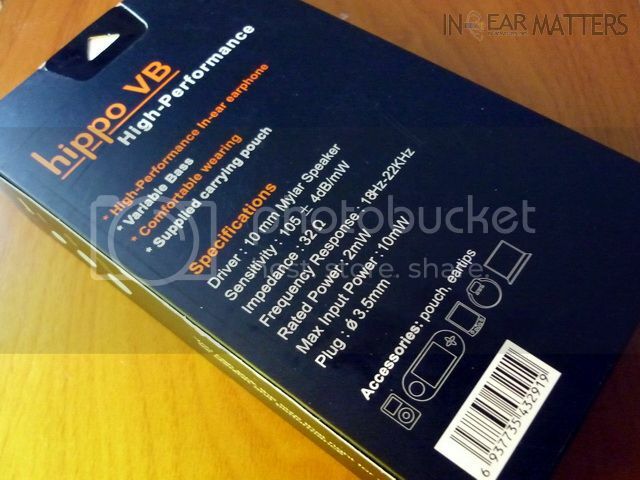 Mid and treble have better resolution due to better airiness which also give a better soundstage. This by far is the best sounding bass plate. On the dot-less / big bass plate, bass is noticeably more boomy and much warmer, which in term floors over the detail and mud up the mid, treble and soundstage. Regardless of which kind bass plates, the treble does get sibilant from time to time on brighter music (except it is less noticeable in big bass plate due to the excessive warm muddiness). I listened to VB under a quick frequency sweep and it performs surprisingly well from top to bottom, but there are a few spikes on the upper region which probably is the reason of the sibilance issue. As a result, sometime there can be too many sparkles in the treble which sounds too 'busy'. However, the sibilance is not to the level of annoyance as long as you keep the volume to a reasonable level. Shroom has a better control on treble in comparison. In many ways VB sounds like the CrossRoads Woody 2 without the wood lushness, while tuned more toward a livelier, focus sound signature (and no doubt both have been benefited from the larger dynamic transducer). It might have minor issue here and there, but VB has outperformed its price tag. For those who enjoy a warm, musical, and lively sound, VB is a great sub-$100 option.